October 30, 2014 – The Mars Atmosphere and Volatile Evolution (MAVEN) spacecraft has completed the Periapsis Lowering Maneuvers necessary to place it into its 4.5-hour elliptical science mapping orbit around Mars. MAVEN’s orbit is designed so that the craft will visit a wide range of Martian latitudes and encounter all of the different solar wind interaction regions. At its closest point, MAVEN will be flying in the upper atmosphere about 93 miles (150 km) above the surface of the Red Planet. At its farthest point, the spacecraft will be around 3,860 miles (6,220 km) above the surface, a vantage point that will allow it to observe the entire planet. 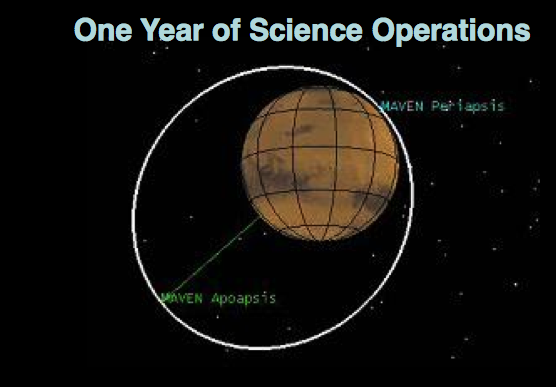 MAVEN will also execute five Deep Dip campaigns, each lasting 20 orbits, or approximately five days. During a Deep Dip, MAVEN will descend to a lower periapsis altitude of around 77.6 miles (125 km) to sample a denser region of the upper atmosphere. 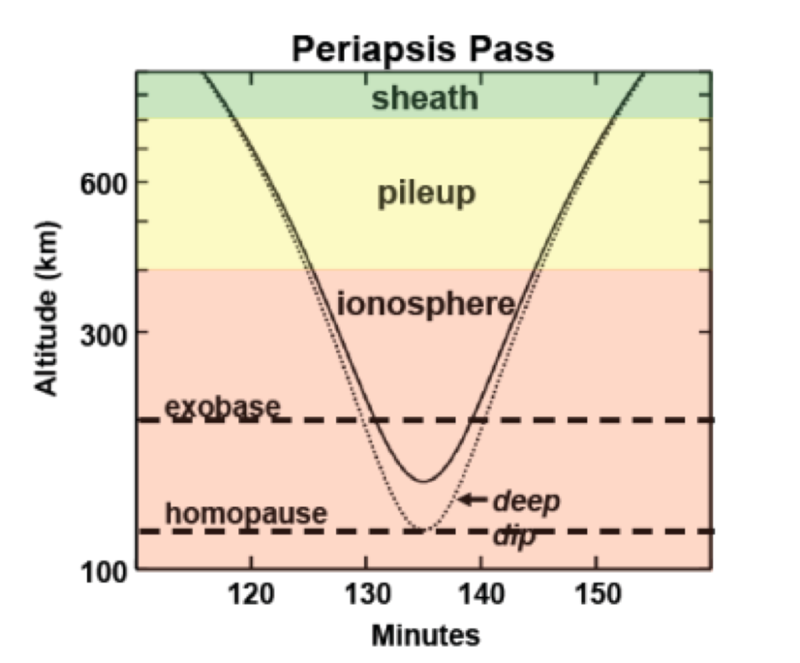 At this altitude, Mars’ atmosphere is about 30 times more dense than at MAVEN’s science mapping periapsis. Many of the design features, algorithms, processes, and lessons learned from previous Mars missions support Deep Dip operations. For instance, MAVEN’s gull-wing solar panel design bends at a 20-degree angle. As MAVEN travels through the upper atmosphere, the air pressure increases to a point that could disrupt flight dynamics if the solar panels were flat. MAVEN’s bent solar panels shift the center of air pressure away from the spacecraft’s center of gravity, providing a self-stabilizing configuration for atmospheric flight. The effect is similar to the self-stabilization provided by feathers on a badminton shuttlecock. While in its nominal science mapping orbits, MAVEN’s solar panels will face the sun most of the time. The articulated payload platform will continually move to orient its three instruments correctly. This orientation will vary depending on MAVEN’s position in its orbit. With MAVEN’s normal orbital operations, and the Deep Dip campaigns, the instruments will be able to make measurements throughout the entire upper atmosphere, from its base to its upper boundary, where it interacts with the solar wind. MAVEN is the first spacecraft dedicated to exploring the upper atmosphere of Mars, the processes that control it, and the overall atmospheric loss that is occurring. Specifically, MAVEN is exploring the processes through which the top of the Martian atmosphere can be lost to space. Scientists think that this loss could explain the changes in the Mars climate that have occurred over the last four billion years. Geological evidence, and recent Mars missions, have supplied conclusive evidence of flowing water on ancient Mars. Surface features imaged from orbit and by rovers show river networks, lake basins, and glacier formations. Evidence also indicates that Mars’ climate was also much warmer in the past, but today the planet is a cold, dry desert. MAVEN scientists hope to determine how the planet lost its early atmosphere and its abundant liquid water. Scientists acknowledge two hypotheses for where the air may have gone – either down into the ground through geological processes, or up and out into space. What scientists don’t know is how important each of these processes is. Rovers have found some carbonate minerals (formed from carbon dioxide) in Martian soil, but not enough to account for all of the missing air. During MAVEN’s one-Earth-year primary mission, scientists will monitor how escaping gas composition changes in reaction to different space weather events and use this data to reconstruct a model of the ancient Martian atmosphere and a timeline of its escape. This data will help scientists understand the evolution of Martian climate and the history of the planet’s ability to support life. MAVEN launched on November 18, 2013 atop a United Launch Alliance Atlas V rocket from Cape Canaveral Air Force Station in Florida, and successfully entered Mars’ orbit on September 21, 2014. Following orbit insertion, MAVEN began a 6-week commissioning phase that included testing the instruments and science-mapping sequences, and maneuvering into its final science orbit. It will now begin its primary year-long mission. If the mission continues for a second Earth year, MAVEN will be able to enhance its science investigations by observing all of Mars’ seasons through a full Martian year (98 weeks). Further mission extensions could cover a greater period of the Sun’s 11-year solar cycle and provide data on year-to-year variability in both Martian weather and space weather. During a long-duration extended science mission, ground crews will raise MAVEN’s periapsis altitude to 137 miles (220 km). At this altitude, MAVEN can continue science observations for another six years with minimal fuel use and continue to serve as a communications relay for ground-based Mars spacecraft. MAVEN is led by its Principal Investigator Bruce Jakosky, from the University of Colorado at Boulder. The university built two of the eight science instruments and is conducting the mission’s science operations. Lockheed Martin of Littleton, Colorado, built the spacecraft and is performing mission operations. NASA’s Goddard Space Flight Center in Greenbelt, Maryland manages the project and built two of the science instruments. The University of California at Berkeley Space Sciences Laboratory built the remaining four science instruments. NASA’s Jet Propulsion Laboratory, Pasadena, California, provides program management via the Mars Program Office as well as data-relay telecommunications hardware and operations, navigation support, and Deep Space Network operations.